So, breakfast cookies. Easy to pack, chock full of stuff I feel good about her eating. I didn't have time to try to stage a photo that would make some big lumpy cookies look lovely. They taste great, though -- not very sweet at all, lots of good stuff that will have you picking at your teeth for ages after eating one of these bad boys. We only had a sad bag of basically walnut crumbs left, so I used half walnut and half pecan, toasted and then chopped into oblivion. I usually leave nuts in cookies or muffins sort of chunky, but I wasn't even paying attention tonight when I was pounding on that chopper (that sounds dirty), and they ended up practically powder. That's fine, though. And we also didn't have any bran or other flake cereal in the house, so I used Grape Nuts. Oh, and I didn't have pastry flour, so I just used regular whole wheat and all-purpose. I have no clue how that may have changed the final outcome. This is a great, super-easy recipe and lends itself to countless variations. I'll definitely try with dried cranberries, and with some fruit-sweetened chocolate chips. Yum! Pounding on the chopper is a good way to get your frustrations out, even if it sounds dirty. :o) Hope your little one likes the cookies. Grape Nuts sound like a good sub, too. 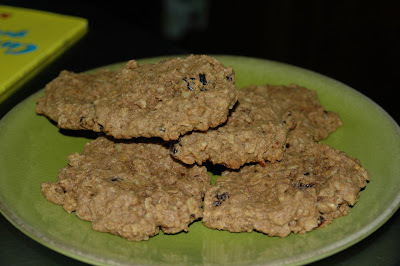 Your cookies look like real oatmeal cookies. Yum! Welcome to CEiMB!!! Wow, Grape Nuts are a total blast from the past!! I bet that was a great sub! Your cookies look awesome! Welcome to the group; I'm glad you enjoyed your first recipe! Welcome to CEimB...I am so glad you are doing this too...my short people liked it too...and I had a whole bunch of them :). LOL at this; "I didn't have time to try to stage a photo that would make some big lumpy cookies look lovely." ... and don't sweat it. I'm sure if you tell kids they are getting a "cookie" for breakfast so long as it doesn't have hair on it, they'll be happy to eat it! great job! I hope the girls like these. I think that the pastry flour just makes the cookie more tender, kind of like how cake flour makes a lighter more tender cake. I did have some WW pastry flour and my cookies came out very puffy and cakey, which I THINK is partially from that flour. Welcome to CEiMB! You can never go wrong with cookies.. ! Did your daughter like them? Great job and welcome to CEiMB! Your changes sound great, and I agree that adding chocolate chips can only enhance these guys!